The days of making mashed potatoes on the stove top are behind us! 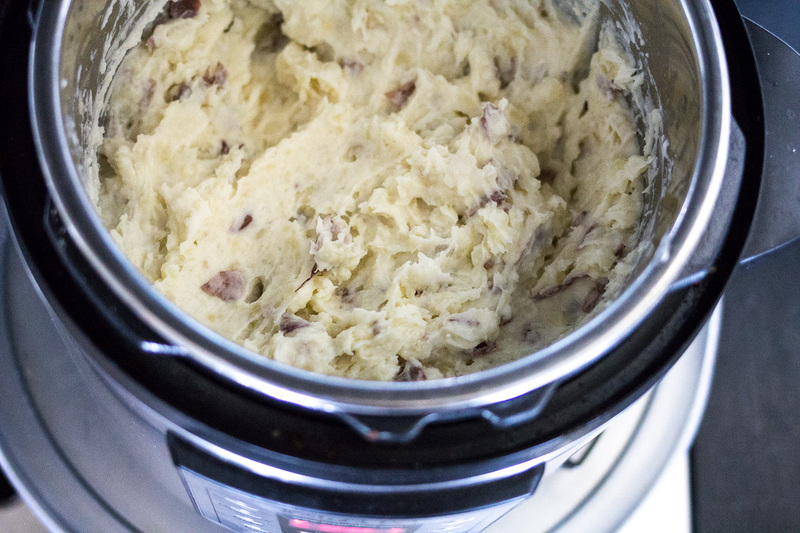 This Instant Pot Mashed Potato Recipe is my favorite way to make mashed potatoes in minutes and keep warm until ready to serve, all in one pot! 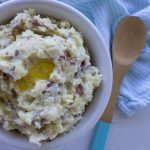 There are so many uses for the Instant Pot from making one-pot dinners to cooking side dishes like this Instant Pot Mashed Potato Recipe! I love the way the Instant Pot cooks and also keeps the finished dish nice and warm until time to serve. Our former stand-by for mashed potatoes was ABK’s Slow Cooker Mashed Potatoes. If you don’t have an Instant Pot, it is the perfect way to cook potatoes and keep warm without cooking stovetop! The downside to using the slow cooker is the cooking time is 4 hours, compared to about 30 minutes total (including mashing) in the Instant Pot! My preference for mashed potatoes is a small red potato. A few reasons why I like this variety of potato: They are easy to scrub and don’t need to be cut up before using. I like a bit of color in my mashed potato, so leaving the skin on small red potatoes and then mashing works well for me. Red potatoes have better flavor than a Russet (imho), which are the premium potato for mashing. Russetts will yield the most fluffy mashed potato, if you are looking for a smooth, fluffy finished product! I like my mashed potatoes to be a bit more rustic looking and don’t mind it when my mashed potatoes have a few chunks of potato. While many people use an electric mixer, I always use a Potato Masher, this one is my favorite. 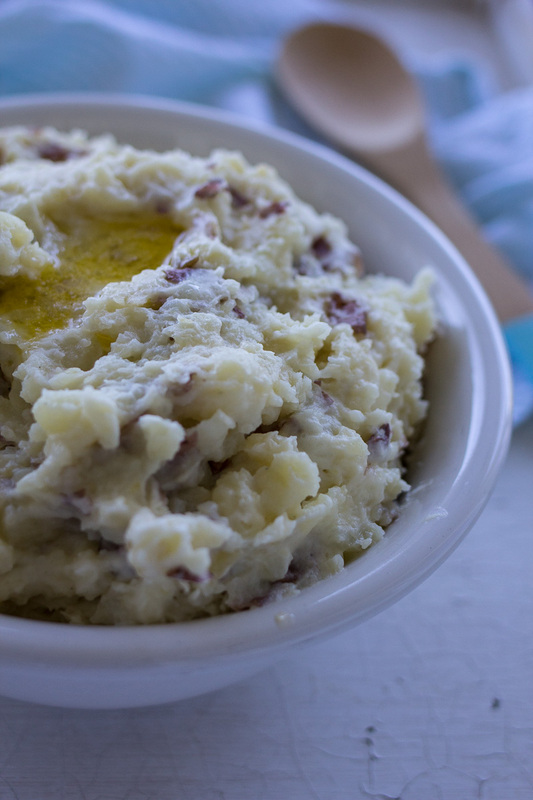 Once you try ABK’s Instant Pot Mashed Potato Recipe you’ll never go back to boiling potatoes on the stovetop. For holidays, this method is perfect because it frees up space on the stove and also keeps the potatoes warm for hours. One less dish to worry about when you’re trying to get a big meal on the table, hot, all at once. 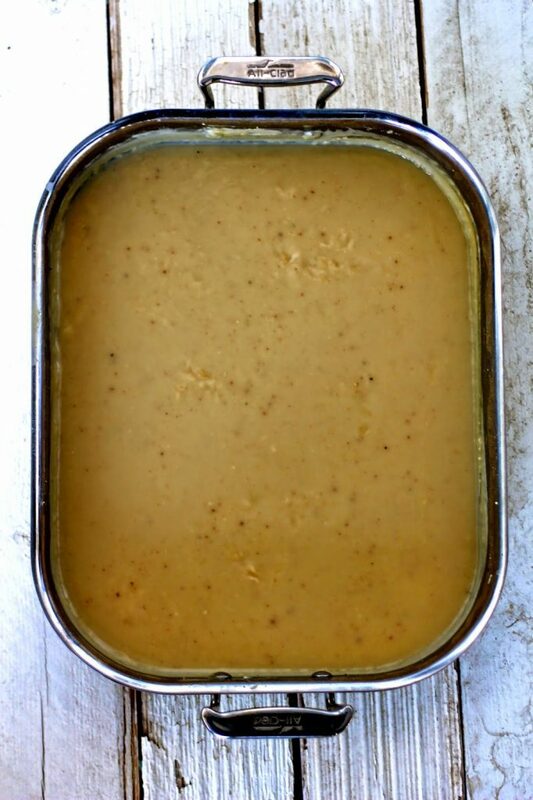 If you are looking for gravy to top your Instant Pot Mashed Potatoes, take a look at this recipe for Simple Pan Gravy! Turn the Instant Pot to heat up the pot. Place washed potatoes into the Instant Pot. Place the lid on the pot, making sure the seal is in place inside the lid. Turn the lid to the closed position, and make sure the top is set to the "seal" position. Use the Manual setting and turn the Instant Pot on and set the time for 15 minutes. While the potatoes are cooking, melt 12 tablespoons of butter and warm the half and half in a measuring cup in microwave for about 1 minute, or just until warm. Set aside until potatoes are finished cooking. After the timer goes off, manually release the steam by turning the vent to the VENTING position, make sure to not place arm in the way of the steam vent! After all pressure has been released, remove the lid. Drain the excess water out of the Instant Pot. Add the melted butter and half and half and salt to the hot potatoes in the Instant Pot. 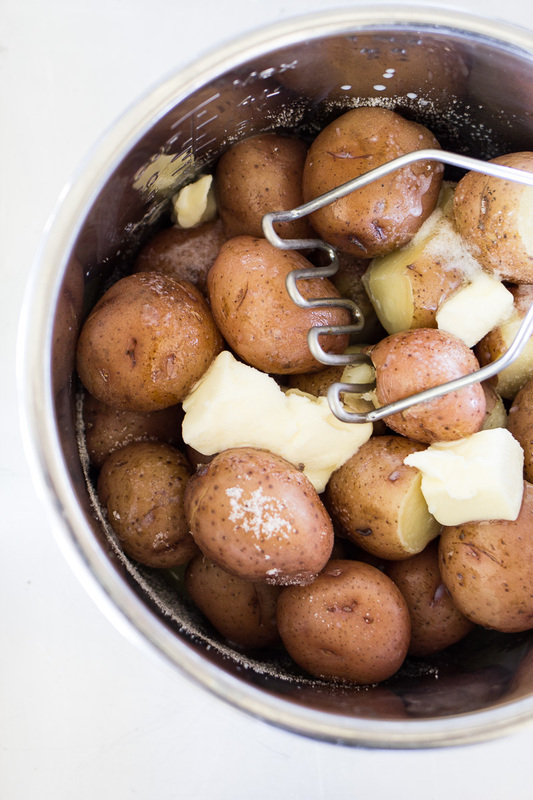 Using a potato masher or an electric hand mixer, mash the potatoes until desired consistency. Add sour cream and about 1 1/2 teaspoons salt to taste. If the potatoes are not creamy enough, add more sour cream and or half and half. Leave mashed potatoes in the Instant Pot on warm setting until ready to serve. -I add sour cream to keep the potatoes smooth even after re-heating. -Often times, I don't drain the water that I added to the Instant Pot to cook the potatoes. One less step! ** When I first started experimenting with this recipe I used 1/2 cup water, but have found that 1 cup water works better in cooking the potatoes thoroughly. When I use 1 cup of water, I drain off the water before adding the remaining ingredients! -If you are using Russets, always remove the peel. Russet skins are quite tough. You can leave the skins on the Russets when they cook, they will pop right off after being steamed in the Instant Pot, then mash and add butter and other ingredients. If using Red Potatoes, try leaving the skins on, they blend nicely into the mashed potatoes! Wow! 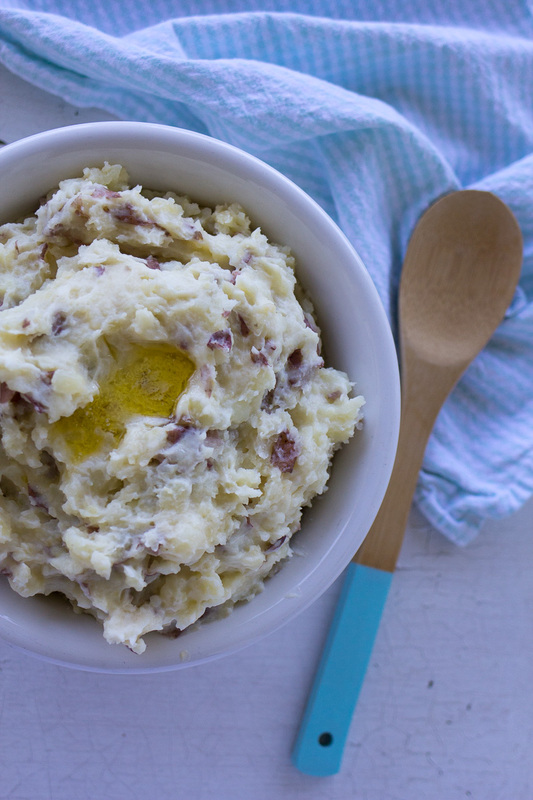 This instant pot mashed potato looks very scrumptious. Thanks for sharing the recipe. I made these tonight and oh my goodness. They are amazing and so easy! Game changer for mashed potatoes. I used red potatoes with skin on, they were perfect. I love the flavor of the red potatoes, and not peeling them is a bonus! I loved your slow cooker recipe last year, but I just made this instant pot version and am in Heaven! It was so easy. Thank you! Thanks so much for your feedback! We made these potatoes for Thanksgiving and they were fantastic. I love all the time saved using the IP! Please let me know if you try any other Instant Pot recipes at ABK. Would this work for a smaller serving size as well? Say, I’m only feeding my family of 4. I’m excited to try this! I am terrible at making mashed potatoes. I have used 2.5 pounds of potatoes and reduced the water to 1/2 cup. They turned out great. Hope you enjoy cooking for your family in the Instant Pot! Leftover mashed potatoes are always yummy too! Thank you for this and other instant pot recipes! This was my favorite time hack I have tried so far. Delicious and really did take less than 30 minutes, for the whole process! I used milk because I did not have cream, and they were still creamy and flavorful. I’m glad you enjoyed this recipe, Erin. It’s my new go-to for quick mashed potatoes too. Thanks for sharing and for reading ABK! Lived by your tday first timer’s post three years ago when I hosted for the first time. Loved the slow cooker potatoes but have since upgraded to in Instant Pot. So excited to see this recipe listed on the same link that I’m re-visiting now that I’m hosting for my second time. I’m grateful to Becky at Vintage Mixer for pointing me in your direction three years ago! 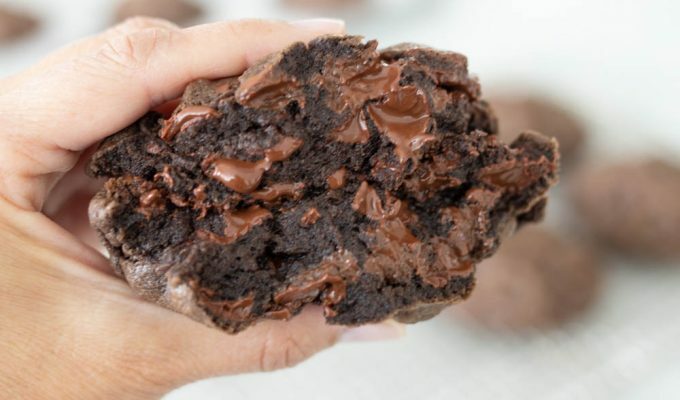 How would I go about doubling up the recipe? Just cook the potatoes in 2 batches and then combine? I have 16 adults and 8 kids, so I’m not sure one batch would be enough? Hi Jennifer, I would cook the potatoes in 2 batches, that way you know they are being cooked thoroughly. Thanks for asking and for reading ABK! A 5 lb bag looks so small – I’ve got 8 adults – 6 children ( kids really don’t eat mashed potatoes) could I add a few more potatoes just to be safe? Or will 5 lbs really do the job. Thanks hosting Thanksgiving for the first time! Hi Leisa, I think 5 lbs should do the job, but you could definitely add more potatoes just to be safe! Thanks! I will do that! First time hosting – fingers crossed! Hi! Maybe I’m reading it wrong, but in the recipe it says to use 1 cup of water (with 5 lbs of potatoes), but in the directions it says 1/2 cup. I’m still new with my Instant Pot and don’t want to mess up. Can you please clarify? Thank you! Hi Meghan, you use 1/2 cup water for this recipe. Thanks for letting me know so I can fix it! Hi Si! I sure love your blog! You’ve made me smile many times while reading through the prefaces to each recipe. Sometimes I don’t know what I love more – your prefaces or your recipes! Haha! Anyhow, I made these mashed potatoes for a trial run on Sunday and they were fabulous!!! Thank you so much for sharing the recipe! One question though. I need to make enough for 12 adults. I’ve seen other IP Mashed Potato recipes that allow for 8 pounds in an 8 at. Instant Pot. Would you recommend doing that much at once? Would I double the water and the cooking time?